‘Alī ibn al-‘Abbās al-Majūsī, known to Europeans as Haly Abbās, was from a Persian family with Zoroastrian forebears, though he himself was a Muslim. He dedicated his Complete Book of the Medical Art (Kitāb Kāmil al-ṣinā‘ah al-ṭibbīyah), also called The Royal Book (al-Kitāb al-Malikī) to ‘Adud al-Dawlah Fana-Khusraw, the ruler of Persia and Iraq from 949 to 983 and founder of hospitals in both Baghdad and Shiraz. 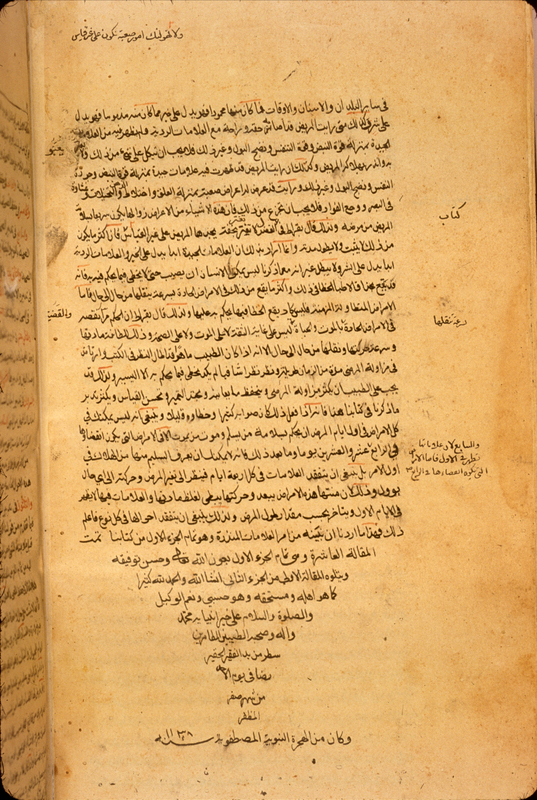 The Complete Book of the Medical Art was written in part as an attempt to redress the lack of proper organization and insufficient attention to anatomy and surgery that al-Majusi found in the Ḥāwī by al-Rāzī. see the entry above for the treatise by al-Rāzī that was criticized by al-Majūsī. The Complete Book of the Medical Art is divided into two parts. The first part (juz') is on medical theory in ten sections (maqalahs) and the second is on therapeutics, also in ten sections (maqalahs). It is one of the most comprehensive and well-organized medical compendia of early medical literature, and was translated into Latin as the Pantegni and as Regalis dispositio or Liber regius. Its division into two discrete parts, theoretical and practical, established a format common to later medieval medical writings. For other copies of the treatise, see Gerard Troupeau, "Manuscripts of the Kāmil as-sina‘a", in Constantine the African and ‘Ali ibn al-‘Abbas al-Magusi: The Pantegni and Related Texts, ed. by Charles Burnett and Danielle Jacquart (Leiden: Brill, 1994), p. 303-315; Ullmann, Medizin, p. 140-141; and Sezgin GAS III, p. 321-322. Additional copies are described in Farid Sami Haddad and Hans Hinrich Biesterfeldt, Fihris al-makhtutat al-tibbiyah al-‘arabiyah fi maktabat al-Duktur Sami Ibrahim Haddad (Aleppo: Ma‘had al-Turath al-‘Ilmi al-‘Arabi, Jami‘at Halab, 1984/1404) p. 127-8 no. 90 and p. 49-51 nos. 18-19 (the copies described in the latter pages are now in the Wellcome Library for the History and Understanding of Medicine, London); and Savage-Smith, "Bodleian", MSS Hunt. donat. 31, Hunt 436, Marsh 105, Hunt. 195, Bruce 38, and Digby Or. 23. There is no modern translation or edition of the entire treatise. The anatomical portions were printed (based on Leiden MS Warn. 94, Berlin MS 6262, and Paris MS arabe 2871) and translated into French by Pieter de Koning, Trois traites d'anatomie arabes par Muḥammad ibn Zakariyya al-Razi, ‘Ali ibn al-‘Abbas and ‘Ali ibn Sina (Leiden: Brill, 1903; reprinted Frankfurt: Institut fur Geschichte der Arabisch-Islamischen Wissenschaften, 1986), p. 90-431. 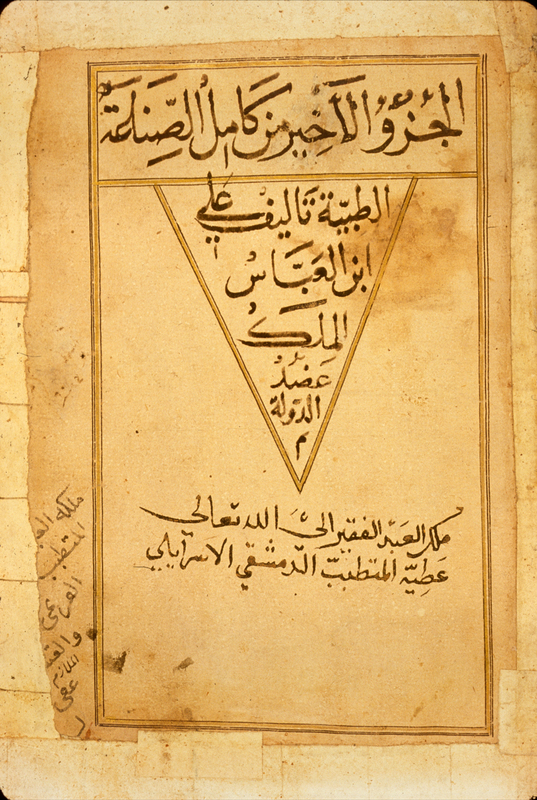 The original title page to this copy of al-Majusi's Complete Book of the Medical Art (Kitāb Kāmil al-ṣinā‘ah al-ṭibbīyah) has had a piece of paper pasted over it. On this later paper the title and the author have been written within gold and black frames, very similar to those found at the beginning of the text itself. Beneath the title and the author, and written in the same hand, is an owner's note reading: "Property of the poor servant of God, ‘Aṭīyah al-mutaṭabbib al-Dimashqī al-Isrā’īlī" --that is, ‘Aṭīyah the Jewish physician of Damascus. This owner is the same person who at one time owned the autograph copy of part of a huge medical encyclopedia with a similar title (Kitāb al-Shamil fi al-sina‘ah al-tibbiyah), projected to be 300 volumes, that was written by Ibn al-Nafīs in the 13th century. The manuscript, in Ibn al-Nafīs's own hand, is now in the Lane Medical Library at Stanford University (MS A.276) and has the owner's name written as ‘Aṭīyah al-mutaṭabbib al-Dimashqī al-Isrā’īlī. 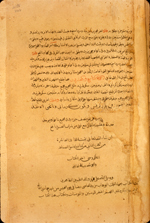 The colophon to a copy of al-Majusi's Complete Book of the Medical Art in which it is stated that the copy was finished on 7 Dhu al-Qa‘dah 604 [= 15 May 1208] by the Christian scribe Tawmā ibn Yūsuf ibn Sarkis al-Masīḥī, who copied it for Maḥmūd ibn Zaki al-Ruqiy al-Shihabi. The copy was made in a district of Shahrazur, which is a province of western Kurdistan. Arabic. 237 leaves. Dimensions 24 x 16.5 cm; text area 19.2 x 11.3 cm; 16 lines per page. The title given on the title page, fol. 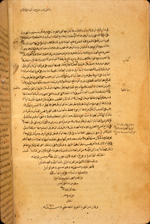 1a, is Kitāb Kāmil al-ṣinā‘ah al-ṭibbīyah. In the text itself (fol. 1b) it is said that it is the Complete Book of Medicine also called The Royal (Kāmil al-ṣinā‘ah al-ṭibbīyah al-ma‘ruf bi-al-maliki). A similar statement occurs in the colophon (fol. 237a). The author's name occurs on fols. 1a, 1b, and 94a. The patron for whom the treatise was written, ‘Adud al-Dawlah [Fana-Khusraw] is named on fol. 1b. According to the colophon on fol. 237a, the copy was finished on 7 Dhu al-Qa‘dah 604 H [= AD 15 May 1208] by the Christian scribe Tawmā ibn Yūsuf ibn Sarkis al-Masīḥī, who copied it for Maḥmūd ibn Zaki al-Ruqiy al-Shihabi. The location is given as a place (bi-manzil) known as al-Batih (literally, "marsh") in the district of Shahrazur, which is a province of western Kurdistan (for Shahrazur, see EI (2nd ed. ), vol. 9, p. 218-219). The copy contains only the last two chapters (maqalahs 9 and 10) of the second part (juz'). These chapters are concerned with surgery and compound remedies. The text is written in a medium-large, widely-spaced, careful naskh script with occasional vocalization. Brown ink fading to a lighter shade; there is some bleedthrough. There are large headings in red but no catchwords. The letters ‘ayn and the gutteral ha' usually have a minuscule letter beneath; the letter kaf in a medial position has a small hook or minuscule letter above, and the letter sin has a small "v" or caron over it. There has been some re-inking on damaged papers, particularly at the ends of the volume. There are marginalia in several hands. The volume has been collated, with collation notes on fol. 48a and elsewhere. There are also marginal corrections. Fols. 53 and 54 have portions copied in a later hand and pasted in. The title page consists of a later piece of paper pasted onto the first leaf and is written in a slightly different hand. The lightly-glossed biscuit paper has evenly scattered large fibers and sagging horizontal laid lines, at times very distinct. There are no chain lines. The paper is damp stained near the edges and soiled with grime and thumbing; the edges have been trimmed from their original size. Folios near the front and back of the volume have been damaged and crudely repaired. Fols. 53 and 54 have had a large portion of the folios replaced and the text rewritten. The volume consists of 237 leaves plus one back leaf. Fol. 237b is blank. The unnumbered leaf at the end consists of two pieces of paper pasted onto either side of a third sheet of paper; these scraps of paper have casually written notes on them in much later hands, one dated 1201 [= AD 1786] and another 1241 [= AD 1825]. The volume was foliated in Arabic numerals as well as in abjad letter-numerals. Toward the back of the volume the letter-numerals repeat and are not aligned with the Arabic numerals. Fol. 69 (in both the Arabic numerals and the abjad letter-numerals), 81, 179, and 183-188 are missing, while there are two folios with numerals 79, 233, and 239, so that by the end of the volume the numerals are off by a factor of six from the recent foliation that has been pencilled on the folios in Western numerals. The volume is bound in a badly damaged brown leather binding that has incorporated older covers of pasteboard covered with brown leather. These older covers have a small blind-stamped central mandorla medallion with pendants. There are paper pastedowns and two blank relatively recent endpapers at either end. The title page (fol. 1a) has had a piece of paper pasted over it. On this later paper the title and the author have been written within gold and black frames, very similar to those found at the beginning of the text itself. Beneath the title and the author, and written in the same hand, is an owner's note reading: "Property of the poor servant of God, ‘Aṭīyah al-mutaṭabbib al-Dimashqī al-Isrā’īlī" -- that is, ‘Aṭīyah the Jewish physician of Damascus. 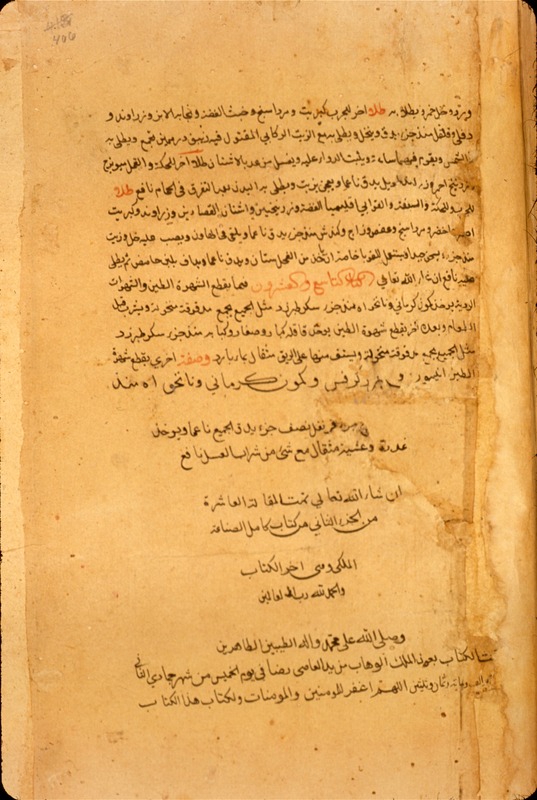 This owner is the same person who at one time owned the autograph copy of part of a huge medical encyclopedia with a similar title (Kitāb al-Shamil fi al-sīnā‘ah al-tibbiyah), projected to be 300 volumes, that was written by Ibn al-Nafīs in the 13th century. 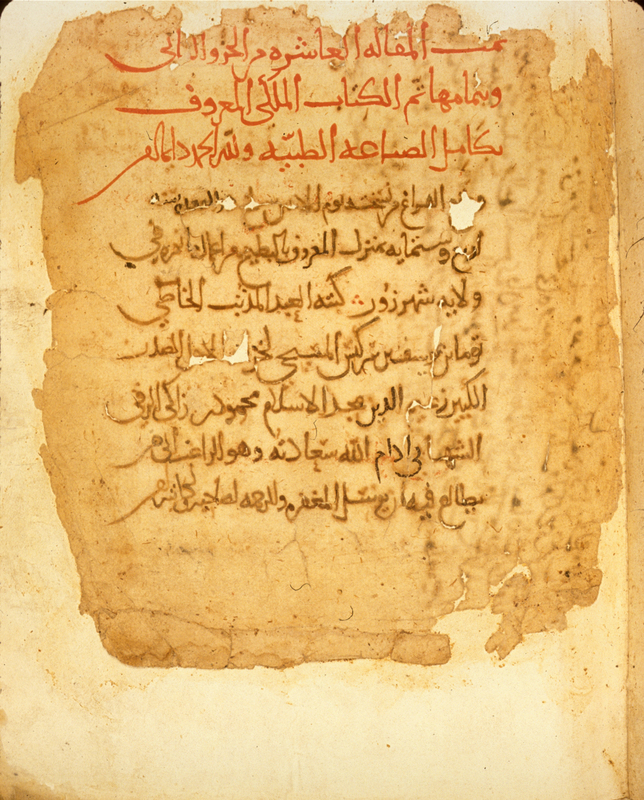 The manuscript, in Ibn al-Nafīs's own hand, is now in the Lane Medical Library at Stanford University (MS A.276). The volume was purchased on 4 November 1948 from H.P. Kraus and received at the Army Medical Library on 4 January 1949 (acq. no. 426398). It was not included in the Schullian/Sommer catalogue. The colophon stating that the copying of the first half of the Complete Book of the Medical Art by al-Majūsī was completed on 1 Safar 1138 [= 9 October 1725]. The copyist is given on the title page as the physician Muḥammad ‘Āḍil al-Ṭabāṭ abā’ī. The colophon stating that the copying of the second half of the Complete Book of the Medical Art by al-Majūsī was completed on 5 Jumadá II 1138 [= 8 February 1726]. The copyist is given on the title page as the physician Muḥammad ‘Āḍil al-Ṭabāṭ abā’ī. Arabic. 406 leaves. Dimensions 31.5 x 17.5 cm; text area 25 x 10.8 cm; 33 lines per page. 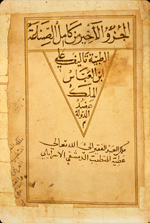 The title Kāmil al-ṣinā‘ah al-ṭibbīyah, known as (al-ma‘ruf bi-) al-maliki is given at the start of the treatise (fol. 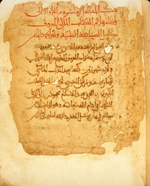 1b), where the author's name is given as Abū al-Hasan ‘Alī ibn [al-]‘Abbās al-Majūsī al-mutatabbib [the physician]. The title page (fol. 1a) gives the short title Kāmil al-ṣinā‘ah and repeats the author's name. The copying of the first half of the treatise, occupying fols. 1-177b, was finished on 1 Safar 1138 [= 9 October 1725], while the second part was finished on 5 Jumadá II 1138 [= 8 February 1726] by the same scribe (colophons are on fol. 177b and fol. 406a). The scribe is identified on the title page (fol. 1a) as Muḥammad ‘Āḍil al-Ṭabāṭ abā’ī al-ṭabīb [the physician]. It is also noted on the title page that the copy was completed in the month of Jumadá II, 1138 [= February 1726]. The copy is nearly complete, though some folios were incorrectly placed at the time of the last binding. Folios appear to be missing between fols. 58/59, 251/252, 317/318, and 352/353. Fols. 250 and 257 should be switched; similarly fols. 284 with 287 and fol. 298 with 305. Fols. 368-384 should follow 361; fol. 385 should follow 365; fol. 366 should follow 405; and fol. 367 should follow 389. The text is written in a small, careful, and consistent naskh script. Dense black ink with headings in red as well as red and black overlinings. The text area has been frame-ruled. There are catchwords. The copy has been heavily annotated, with extensive marginalia and marginal corrections in several hands. There are also some interlinear annotations. There are small line drawings on some folios of cranial sutures and other anatomical structures (fols. 24b, 25a, 29a, 39b, and 46b). The glossy brown paper is thin and fairly translucent. It has occasional think patches, wavy vertical laid lines, but no chain lines. The paper is quite worm-eaten and soiled through thumbing and with grime. Many leaves have been repaired at the edges or with small patched areas. Fols. 1 and 2 are guarded, with holes repaired in fol. 2. The edges have been trimmed from their original size. The volume consists of 406 leaves, with the final folio misnumbered as 407. Fol. 406b [407b] is blank. Many of the folios have Arabic numerals on them, but they do not always correspond to the recent numbering in Western numerals. The volume is bound in a modern European library binding. There are modern endpapers and pastedowns. On fol. 1a there are three oval stamps of former owners (two defaced) and one unreadable owner's signature. The volume was purchased in 1941 by the Army Medical Library from A.S. Yahuda who acquired it from a dealer in Baghdad (ELS No. 1606). Schullian/Sommer, Cat. of incun. & MSS., entry A26, p. 305-6.